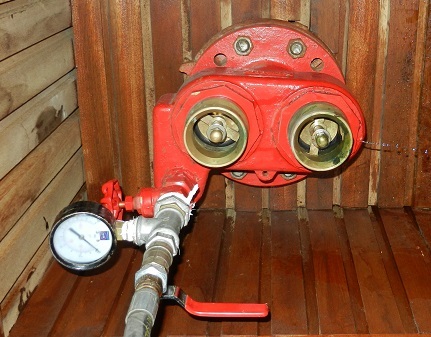 A Dry Riser is part of a fire suppression system in a building. It consists of a dry pipe which runs vertically / horizontally throughout a building with outlets on each floor. The main inlet is normally on the ground floor, where Firefighters can access. Under BS 9990/2006, property owners are obliged for dry risers to be tested annually. How do we test dry risers? InDepth Water Management are leading the way in Dry Riser testing for property owners, facility managers and the hospitality sector. So we are the go to company for services of this nature. After initial visual inspection we test the riser with pressurised water to 10 bars measuring at the inlet for 15 plus minutes. If there is a loss in pressure greater than 0.5 bar then it is a failed test. We check all insets and outlets for leaks and replace missing or faulty items. Then we test the pressure once again before certification is issued. For more information on any of our services, please contact us on 1890 77 22 22 or email us at info@indepth.ie. You can also fill out the form on our Contact Us page. We offer a 24/7 Emergency Call Out Service Nationwide.